Choosing which wedding video package suits you best can be tricky, especially when looking so at many different wedding videographers so we’ve given you 4 basic choices to try and simplify things. All of our wedding film packages include both a short highlights trailer as well as a full feature film of your day which can include the ceremony, speeches and first dance all in full plus all the amazing bits in between set to a backing sound track of your choice. Our films are then delivered on HD USB so you are free to make copies and we can even upload your highlights to our Vimeo page for you to share with your friends and family online. If the packages below do not fit with your plans and you would like a more personal quote for your wedding or event coverage then please get in touch. Add photography to any Full Day or 2 Camera Video package for a discounted rate of £800 for one photographer or £1300 for 2 photographers. See full photography prices below. Feature film in Full HD copy of your feature film on USB Drive. Highlights trailer (usually around 4-5 minutes long). Musical soundtrack of your choice. All travel, P&P and taxes​. The full day is our most popular package and covers up to 8 hours of filming with one videographer. Depending on your itinerary this could typically include bridal preparations through until just after the first dance. 1 videographer filming on one tripod mounted HD DSLR. 8 hours coverage * (additional hours £50 per hour). Feature film in Full HD on USB Drive. This film will include your ceremony, speeches and first dance in full plus all the best bits in between**. Highlights trailer (just like the examples seen our videography page). All travel, P&P and taxes included within 100 miles of London. Expected delivery within 6 weeks of your wedding date (times may increase during peak season). ​Add photography with one photographer for £800 or 2 photographers for £1300. Use extra equipment like sliders and glide-cams to get those beautifully smooth movement shots. Get that reaction shot from both partners walking down the aisle. Capture the ceremony from two angles for greater cinematic effect. Film the photo shoot from multiple angles, or allow one videographer to remain with the guests so nothing is missed. Film close-ups of the speaker during the speeches whilst capturing the audiences reactions. 2 videographers filming with HD DSLRs and using additonal video stabilising equipment for moving shots. 8 hours coverage * (additional hours £50 per hour per videographer). Feature film in Full HD on USB Drive. Musical soundtrack of your choice​. ​Expected delivery within 8 weeks of your wedding date. Full day shoot of up to 10 hours coverage. 3 team crew (2 videographers and an extra videographer/editor) using three cameras during the ceremony and speeches to produce a stunning cinematic film of your wedding day. An 'on the day edit' of your wedding ceremony highlights. During the afternoon and evening (usually around the meal time) we edit a 1-2 minute highlights film from the day so far. We can provide this to your DJ or venue if they have displays screens to show during your reception. ​Receive the 'on the day edit' on a USB on the day or a downloadable file the day after your wedding. A collection of video messages recorded from your guests. Full HD copy of your film on USB Drive. 1 minute 'On the day' trailer. Expected delivery within 8 - 10 weeks of the wedding date. We do not provide aerial videography or photography as part of our packages but we can arrange drone hire separately with one of our recommended pilots, so please speak to us if you would like a quote for drone footage. Our photographer Chris' style is relaxed and natural, avoiding posing where possible and never keeping you away from your guests longer than you want to be. We can provide photography to either work along side our amazing team of videographers or independently with another company. Either way we strive to give you the ultimate coverage. We don’t believe in enforcing photos albums and prints on you, once we deliver your photos they are yours to keep and you are free to make your own printing arrangements. ​Half day shoot covers up to 4 hours * with 200+ images delivered on USB. ​Full day shoots cover up to 8 hours * with 400+ images delivered on USB. We do not include watermarks or printing restrictions on your images. Add photography to any Full Day or 2 Camera video package for £800 (Saving £195). Add photography to our Half Day video Package for £500 (Saving £95). * Coverage hours to run concurrently. ** Time permitting that these events fall within the 8 hour coverage. 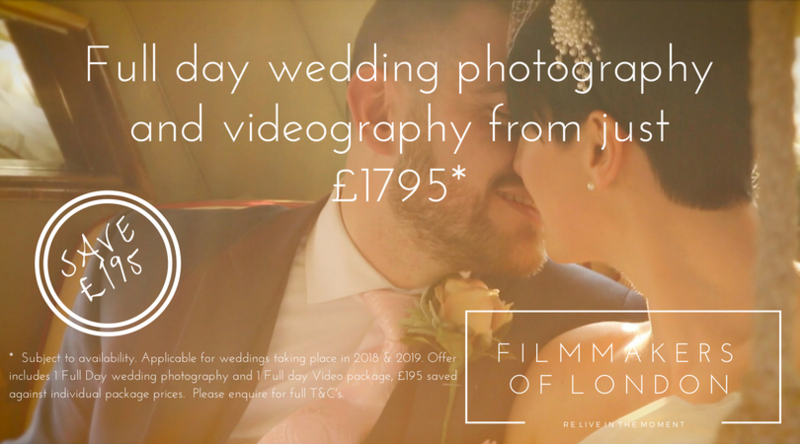 If you would like us to film/take photos for longer than the durations listed above then we simply charge £50 per hour per camera operator on any of our full day packages, or £100 per hour on our half day packages. ​Prices valid until the end of 2019.